3 Why do this career? 5 What are the best options among the health careers we considered? 6 Who is most likely to succeed in these careers? 7 How does it compare to nearby alternatives? 8 Should you become an allied health professional? Do you want to work in health, but don’t fancy nursing or medical school? Meet the ‘Allied Health Professions’. These are the people who helped your sister overcome her stutter (speech pathologists), prescribed your friend their glasses (optometrists), and took the x-ray that time you stubbed your toe so hard you thought you’d broken it (diagnostic radiographers). The allied health professions give you the high job satisfaction of helping patients and will continue to be in demand as the population ages. The training pathways are shorter and less competitive than for medical doctors, and compared to most nurses you’ll have more say over how to treat your patients — plus the pay is often better, sometimes over $100 000 per year. The downsides are that the skills you build aren’t very helpful outside your profession, the best paying options still require up to 8 years at university, and as with any health career in the developed world it’s hard to have a large direct impact. Overall, this is a reasonable option for earning to give, especially if you want an agreeable work schedule, could work in the US or Australia, and can get into the more highly paid professions like dentistry and optometry. Just keep in mind that the big investment in training required for this narrow career path means it’s especially worthwhile for you to explore your options before studying to become a health professional. Caring personality, happy with near-constant social interaction, interest in science (particularly biology), strong on social skills compared to mathematical skills, highly value work-life balance. Profile image from Ken Teegardin. The primary author, Brenton Mayer, who works for 80,000 Hours, drew on his initial training in dentistry and previous experience working as a doctor. We spoke to three people working in these professions and ran a draft of this review past two additional people working in healthcare. We also read existing career profiles on ONET, Prospects and the BLS Occupational Outlook Handbook, as well as some relevant academic literature. Below, you can see a list of the careers we researched. The boundary around “allied health” is vague. We didn’t include clinical psychologists, social workers or alternative health practitioners, even though they’re often included. We did include dentistry, even though it’s often excluded.2 We have separate profiles on medicine and nursing. Most of the jobs in the area earn over $70,000, which is still twice the median income,4 and earnings are generally higher than nursing at $67,000. The highest-earning paths are the most competitive and take the longest time to qualify for. For example, becoming a dentist in the US requires completing a bachelor’s degree with a GPA of around 3.5, and then a 4 year postgraduate degree. For those interested in respiratory therapy, the minimum entry requirements are a GPA of 2.5 (or an SAT score in the top 50%), and you can graduate after 2 years. Looking at the short term, most health professions are projected to grow 12-30% between 2014 and 2024, far more than the average of 7% for all jobs. 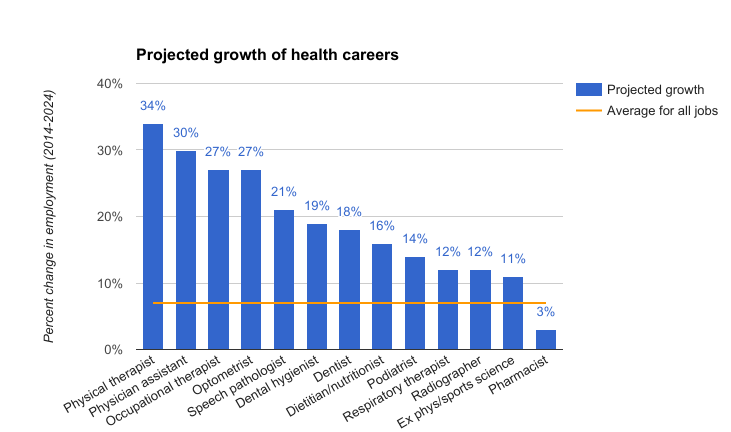 Health professions by projected growth.8 Source: Bureau of Labor Statistics. Turning to the long term, a study by academics at the University of Oxford suggests that jobs focused on delivering patient care are at low risk of automation in the next couple of decades (you can see the estimates for individual professions here)9. This is because it’s difficult to teach computers to correctly interpret and precisely interact with the changing physical space around them, and it’s even more difficult to program the social intelligence needed to look after patients. Studying exercise physiology or sports science leads into a tough job market. Six months after graduating, only 60-70% of graduates are either employed or doing further study in the area.13 Salaries are also the lowest of the health professions we looked into, with many people working in gyms as personal trainers, a position which requires far less education. It’s an unfortunate illustration of some of the pitfalls of ‘following your passion’. This is what we’d expect since the work does well on all the ingredients of job satisfaction we’ve identified in our research. Allied health professionals directly help people in their work, which is satisfying. The work is also engaging: they have clear tasks with frequent feedback and significant responsibility for diagnosing and treating patients. They’ll work alongside other healthcare workers who they can discuss complex cases with, and they typically have less shift work than nurses and less demanding hours than doctors. When working in health, it feels clear that you are helping your patients. Yet, as we explain in the article on medical careers, clinical practice in the developed world only has a modest impact. The key reason for this is that healthcare is already (relatively speaking) well funded in rich countries, so the easy opportunities to help people are already taken, which means additional people and money only have a small impact. Our analysis was focused on doctors, but we think the impact of allied health professionals is unlikely to be significantly higher. 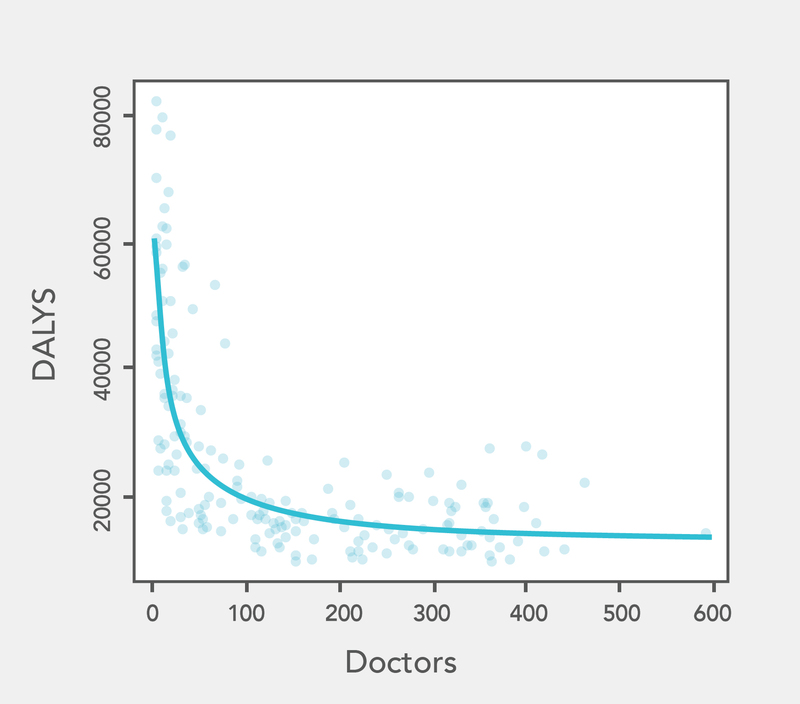 This is WHO data of countries plotted by years lost to ill health (DALYs) against number of doctors per 100 000 people. Beyond a certain threshold, more healthcare doesn’t make much difference, as discussed in greater detail here. If you wanted to maximise your direct impact as a health professional, what could you do? Improve the healthcare system. Perhaps you could serve on the board of your profession’s regulatory body, or work in hospital administration. These positions often seem neglected, and can potentially multiply your impact. Produce high impact research. With several of these options, you can start researching ways to improve your profession’s clinical practice while at university, and if you’re good at it you could make it a big part of your career. For instance, pharmacists sometimes work on developing new drugs.19 Otherwise, work to excel in your area and develop improved treatments and processes. Whilst these are possible, note that only a small proportion of health professionals take these routes, and if you’re aiming to get into one of these areas there are likely better ways to get there. Degrees in medicine (for developing world work), health policy (for improving the healthcare system) and biomedical science/medicine (for high impact research) are all probably better options. In the UK, studying a health profession means making a call at a young age that you’ll remain interested in practicing your specialty for long enough to justify the 3-5 years you’ve spent training for it. In the US, you make this decision later in life because the degrees are often postgraduate, but it means a larger financial commitment and more total time at college (often 8 years in total for the most high-earning options). What’s more, this training only prepares you for a narrow role. We normally recommend people build ‘flexible’ career capital early in their career, that is, skills, connections and credentials which will be useful in a wide range of jobs in the future. This is because it’s hard to predict how the job market will change and what you’ll be interested in in the future. A degree in allied health, in contrast, mainly trains you for a single speciality which exists in a small set of work environments (clinics and hospitals in the developed world). So if you want to leave the career later, you won’t be in a much better position. This could easily happen if your preferences change, you find a better way to have an impact, or if the career does turn out to be vulnerable to automation. Allied health even compares poorly to other vocational training, such as law, accounting or programming. If you qualify as a lawyer, there are many of types of legal work open to you, and legal knowledge is useful in most sectors of the economy, so even if you decide to leave law, you’ve gained something. Studying maths or economics would be even better again for flexibility. 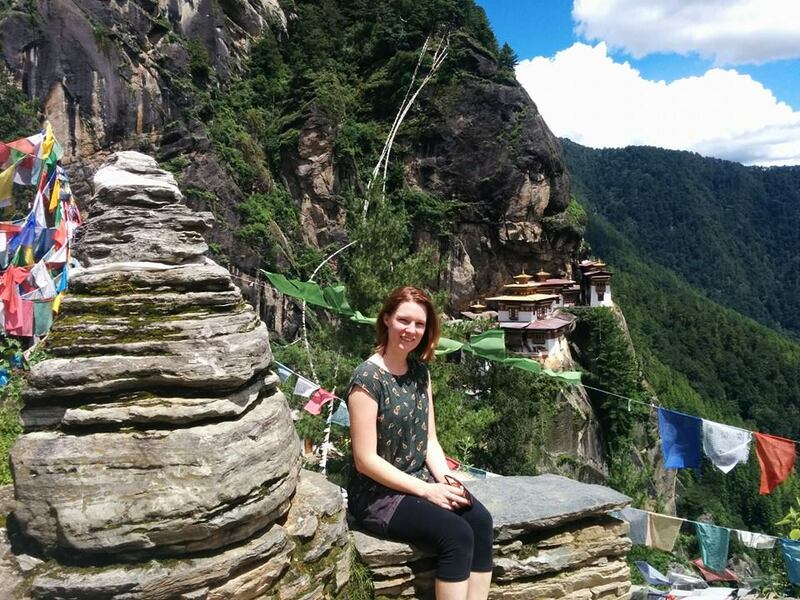 This is Tara, the pharmacist we mentioned earlier who worked in Bhutan. When she decided to leave pharmacy, she realised that a lot of her previous training would no longer be useful. What are the best options among the health careers we considered? The following four stand out. Dentistry has the most opportunity for career advancement amongst the health careers we considered. You can become a dental specialist in one of roughly 9 available specialties. This requires several years of study and on the job training. If you don’t specialise, you can earn diplomas or certificates and attend courses on a range of skills which you’ll use in everyday practice. It’s also amongst the highest paid. 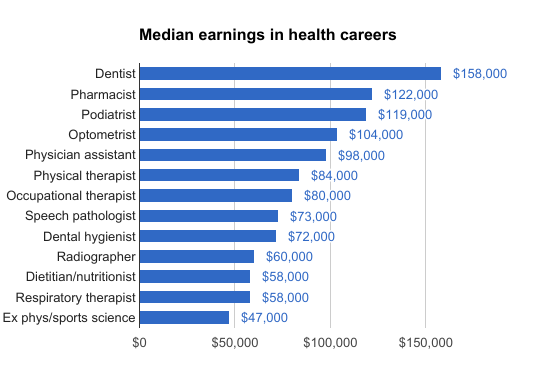 US optometrists earn a median income of $104,000 per year and the top 10% earn over $187,000. UK optometrists earn less than half that, but their training is a 3 year bachelor’s degree rather than a 4 year post-graduate degree. Well paid in the US, with a median income of $122,000 and the top 10% earning over $154,000. Poor job market outlook and high chance of automation compared to other health professions. Who is most likely to succeed in these careers? We think most of the social impact of working in these careers will come from earning to give, and once you’re in the job, the pay doesn’t vary that much (in contrast to something like sales, law or finance). So the key question is whether you can get into a university course, and whether you will enjoy the job enough to remain motivated. Good interpersonal skills, along with an interest in working with and helping people is probably useful, given that you’ll be constantly interacting with the public. We’ve noted above that there are relatively few opportunities for career progression in some health careers, which suggests that people with a high need for growth will be less likely to find these options satisfying. How does it compare to nearby alternatives? Below we make some very rough comparisons between allied health and nearby options people often consider. In all cases, the key consideration is your degree of personal fit. If you excel in an area, you’ll gain better career capital, be happier, earn more, have more direct impact, and have a bigger chance of making original contributions to the field. For instance, it’s probably better to be an outstanding nurse than a typical occupational therapist, even though occupational therapists earn more on average. If you’re deciding between nursing and these professions, from a social impact perspective, lean towards wherever you can earn the most and donating the extra. If you’re deciding between medicine and these professions, probably choose medicine. This is because medicine has higher pay and better exit options, plus better potential for doing advocacy, research and work in the developing world. Software engineering and data science have similar earnings, more flexible career capital and a much shorter training pathway than allied health. If you could enjoy working in one of those areas and be good at it, we’d recommend them over the allied health professions. There are steps to quickly test your potential in software engineering in the full profile. Sales & marketing/real estate have shorter training pathways and similar average earnings to these health careers. Whilst the highest paid people in these fields do better than the highest in allied health, the spread in earnings is larger, so there’s a chance of earning less. If you’re comfortable with this, have relatively good social skills, and are able to deal with the constant rejection associated with sales, these paths might be better. Corporate management usually involves more stress and longer hours than allied health. On the other hand the work is more varied, with greater opportunity for career advancement and more flexible career capital. Median salaries are comparable to the higher end of the allied health professions and if you do well it’s possible to earn much more. Most lawyers (as opposed to those from top firms as considered here) have a similar salary to the more highly paid allied health professions and law is also a good option for those who are strong on verbal skills. It gives you more flexible career capital and a chance to earn a lot more, but the hours are probably longer (particularly at the start of your career) and job satisfaction is lower. We’d recommend whichever you would enjoy and have the best personal fit for. Again, in all cases, the general pros and cons need to be weighed against how much you’d enjoy the job and how good you’d be at it. Should you become an allied health professional? Here are some key questions to ask yourself. Could you find working as a health professional satisfying? Would you enjoy near constant social interaction and working with the general public? Does the health profession you’re considering work in a narrow field which you would find repetitive after a decade or more? Are you comfortable with the idea of earning to give being the main way that you have an impact with your career? Are you reasonably confident that you will follow through with donating a substantial proportion of your future earnings? Relative to your other options, is this a good option for earning to give? Could you get into one of the higher earning pathways, like podiatry, dentistry or optometry? Could you work in a country which pays health workers well, such as Australia or the US? How does it compare to other options you’d consider? Do you highly value having a stable job, which isn’t too demanding of your time, either for personal reasons, or so you can do high-impact volunteering? The allied health professions have standardised career paths, strong projected job growth, and usually 40 hour work weeks. If you value these more than the average person, this is a point in favour of allied health. Most importantly, have you explored other options, so that you’re 80%+ confident that this is the path for you? Becoming a health professional means making a large up-front investment in a career with narrowly applicable career capital and relatively few opportunities for advancement. This makes it really important to explore your other options before committing. Read about how to explore. As always, if you couldn’t imagine yourself doing anything but working as an allied health professional, you should probably become one. Learning more about what the different options involve by reading the BLS and Prospects guides on the professions you’re interested in. You can also look at our wiki which will suggest some more resources. Finding out which professions you could get the grades required to enter, because some of the university courses are very competitive. Looking into what the professions are like day-to-day by speaking to friends of friends who work in the area. Organising to ‘shadow’ someone working in one of these professions for a few days. An ideal setting is a hospital so that you can see what other health care workers are doing and perhaps arrange to do the same with them if you’re interested in their work. Prepare your university application. During your prior education you should be aiming to study all the necessary prerequisite subjects and achieving the required grades. You should demonstrate an interest in the subject through shadowing people or working in a related area. Find and follow some advice tailored to the specific course you’re applying for. Often you’ll need to take a specific admission test and it’s worthwhile studying specifically for that. Finally, apply to a university to train you in your chosen profession. We would guess that optometrists are valuable because preventable visual impairment is an enormous cause of ill health in the developing world. There are often highly cost effective solutions to this, such as correcting focusing errors and other interventions available to optometrists. The WHO estimates that US $202 billion is lost in productivity per year just from focusing errors. This paper estimates that the cost of fixing these is on the order of a few hundred dollars per year of healthy life gained. There are several NGO’s which can be easily found online that are asking for volunteer optometrists to work in the developing world. Fricke, T. R., et al. "Global cost of correcting vision impairment from uncorrected refractive error." Bulletin of the World Health Organization 90.10 (2012): 728-738. Source. Baltussen, Rob, Jeroen Naus, and Hans Limburg. "Cost-effectiveness of screening and correcting refractive errors in school children in Africa, Asia, America and Europe." Health Policy 89.2 (2009): 201-215. Source. Dentists can perform low cost, life improving surgical interventions with limited need for follow up (eg. extractions and fillings - more complicated dentistry is less common in these contexts). It’s not clear how cost effective dentistry is in this context. Like for optometry, there are several NGOs which can be easily found online asking for volunteer dentists to go to the developing world. Benzian, Habib, and Richard Niederman. "Cost effectiveness of dental surgery procedures: a call for strengthening the evidence." World journal of surgery 38.9 (2014): 2484-2485. Source. Pharmacists seem to be particularly valued by organisations delivering emergency care such as Medecines Sans Frontieres. Radiography and podiatry are also probably very useful in some developing world contexts too. For each of these, it’s possible you could increase your impact by getting involved in training locals or improving health systems rather than working directly. Doing this well means spending a large amount of time in your chosen location. You need local buy in, to make sure you understand the context well enough that your changes are improvements, to make sure they’re sustained etc. Tara’s experience, was a good illustration of this, as was the author’s experience working as a final year medical student at a hospital in Fiji. 1) Specialisation - either with a formal specialisation and masters degree as required for orthodontics or prosthodontics (around 10% of dentists specialise like this), or with certificates allowing you to do more lucrative procedures. 2) Creating a stable patient base - staying in one area, perhaps owning your own practice as 25% of US dentists do, and building/maintaining your patient base through excellent bedside manner.